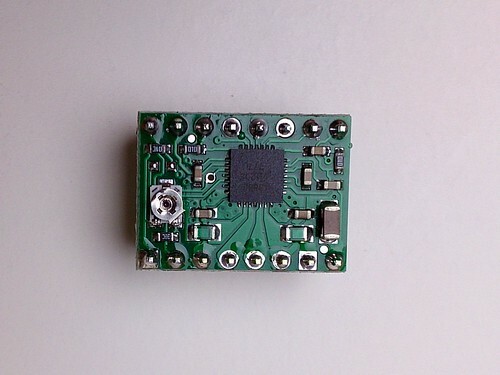 Contraptor Electronics & Motors are assembled from Controller kit and Axis kits. 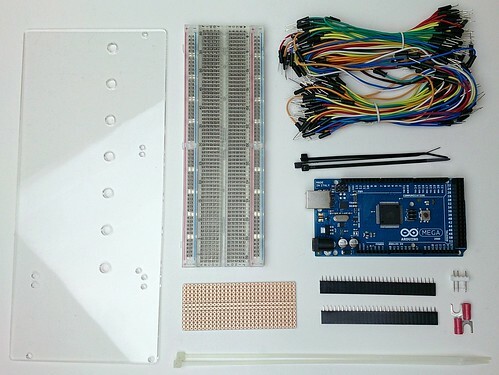 Controller kit includes Arduino, breadboard, mounting plate, jumper wires (pic 4-5), while Axis kit includes components necessary for a single axis - stepper motor, stepper driver, terminals, limit switches and wires to connect it all together (pic 3). 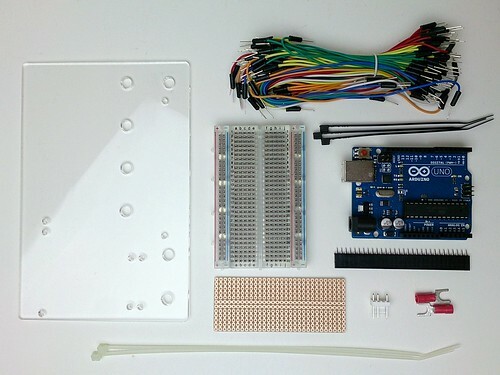 Controller kit has two options - Uno and Mega, which can support 1-3 axes or 1-7 axes respectively. 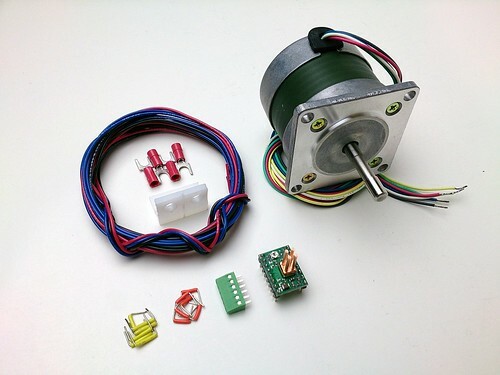 For example, 4-axis electronics/motors can be built from Controller (Mega) kit and 4 Axis kits (pic 1), and 2-axis electronics/motors can be built from Controller (Uno) kit and 2 Axis kits (pic 2). 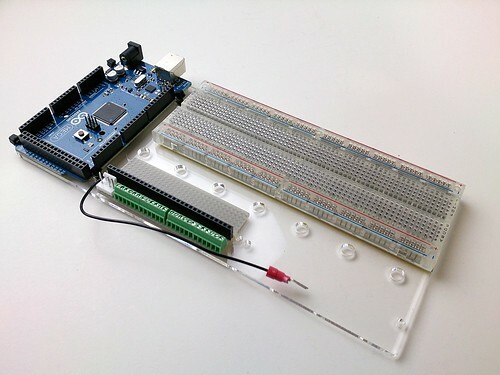 Gather components necessary to solder the protoboard. Cut ~9" length of black hookup wire, strip ¼” of insulation on both ends and crimp the spade terminal to one end. 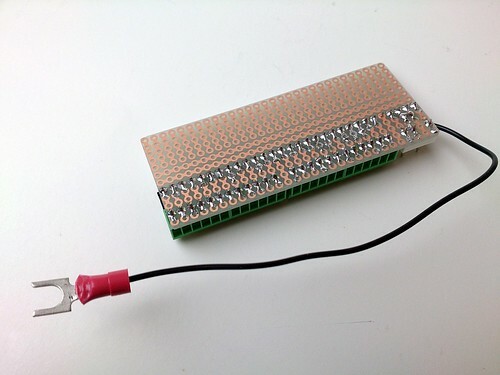 This wire will serve as GND connection of the electronics to the frame. Motor terminals can be arranged side by side one pair at a time. 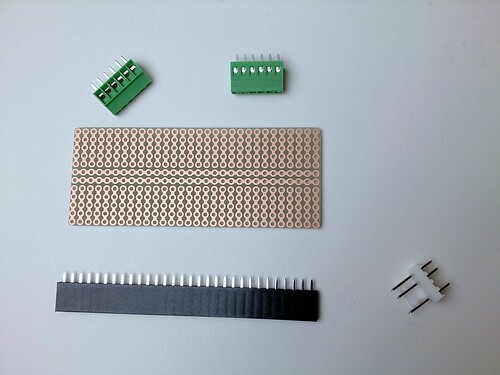 Separate 1x16-pin header in half and solder the resulting pair of 8-pin headers to each side of the Pololu stepper driver. Get the heatsink and adhesive thermal tape. Clean heatsink and chip surface with cloth and rubbing alcohol. 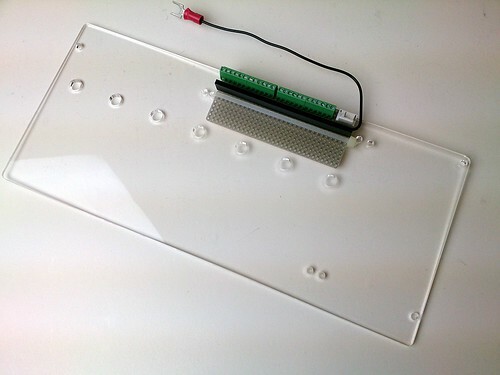 Note that the thermal adhesive tape is not reusable. If for any reason you need to remove the heatsink, you'll need to use new adhesive tape. Be sure to clean both surfaces with rubbing alcohol. Peel off the transparent adhesive backing on the tape and affix it to the heatsink. 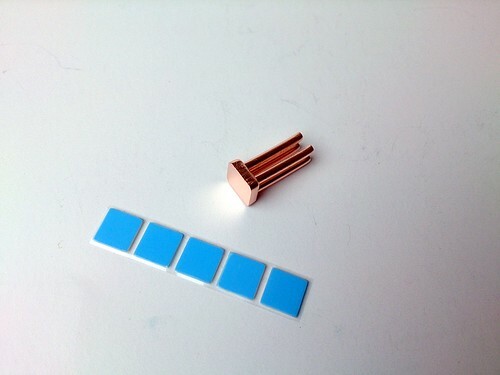 Peel off the blue backing from the tape, carefully center the heatsink on top of the chip and firmly press to affix. 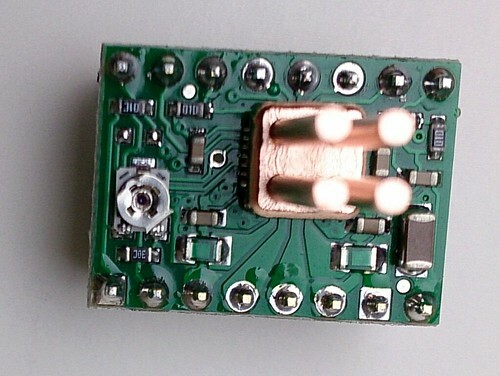 The trimpot on the driver regulates the amount of current that is sent to the motor coils. In the driver orientation shown on the diagram and photo (trimpot on the left), the flat base extending beyond the circle of the trimpot should read ~4 o’clock for Contraptor stepper motors. 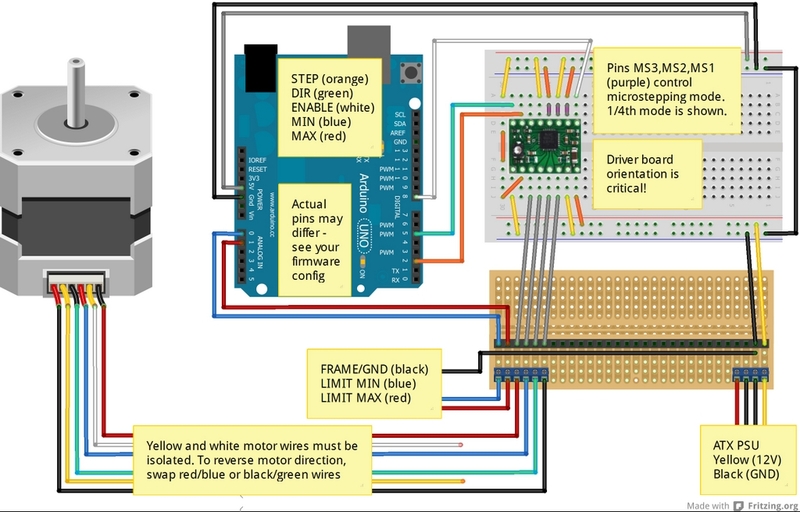 Different motors may need different setting. 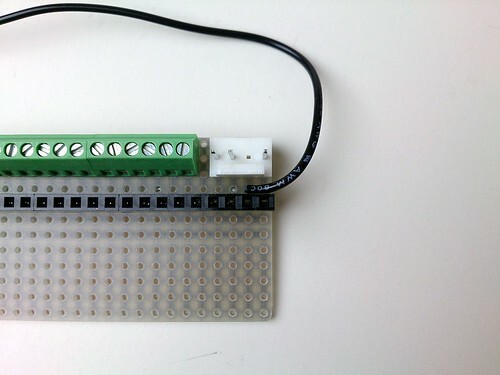 The diagram below illustrates the electronics setup to control one axis. For more axes, add drivers and wiring in the same manner. 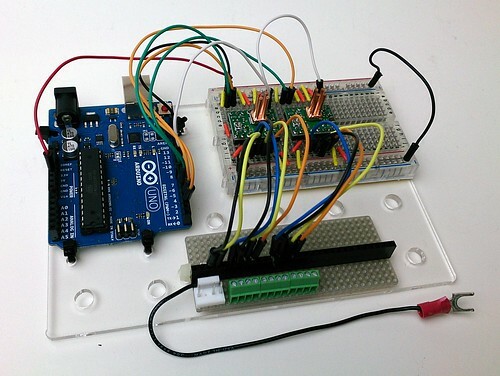 Note that some control lines may be shared - for example, ENABLE line is typically shared among all drivers and therefore uses only one pin on Arduino. 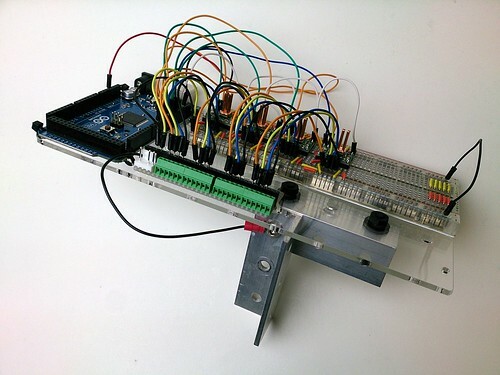 Be sure you get the stepper driver board orientation correctly, otherwise you will blow the driver! 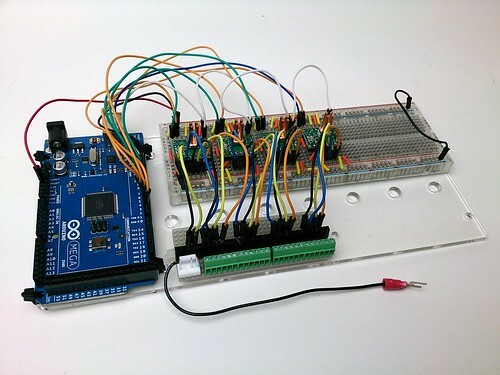 Remember that changing microstepping mode changes number of steps per unit distance, so corresponding changes need to be made in the firmware. For example, if your mechanism requires 100 full steps to move one inch, it will require 8*100 steps in eighth-stepping mode to move the same distance. Contraptor limit switch is a screw mounted on a UHMWPE angle so that it's isolated from the frame (GND). 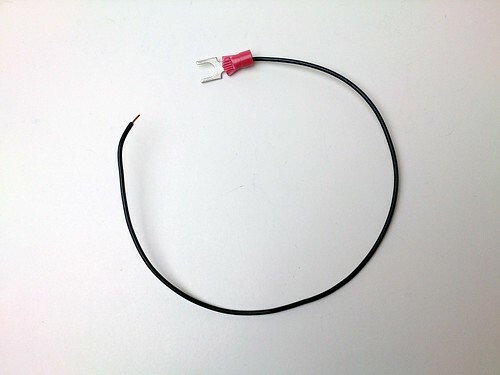 The limit switch wire is connected to the screw via spade terminal. 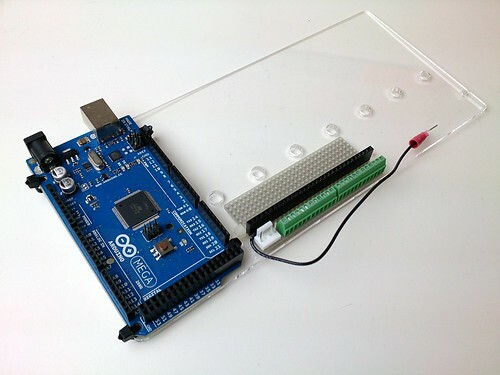 Normally, the limit switch is open and corresponding Arduino pin is High. 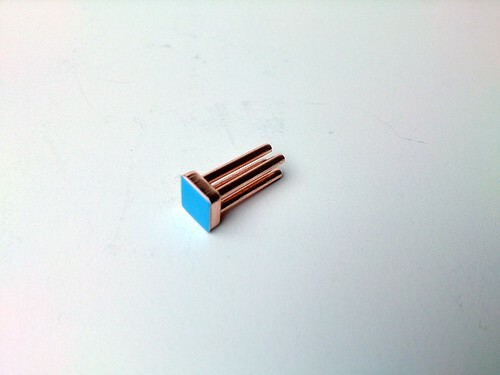 When sliding element, linear bearing, or the frame comes into the contact with the screw, it sets the pin to Low. 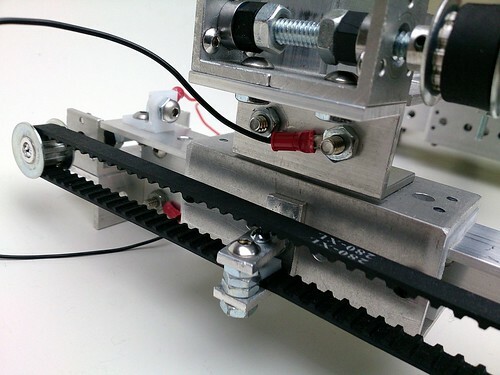 Note that this requires electrical connection between isolated subassemblies of the frame - which is typically the case with sliding elements, linear bearings and everything they're connected to. Use black hookup wire and remaining spade terminals to connect isolated subassemblies to GND (pic 1). 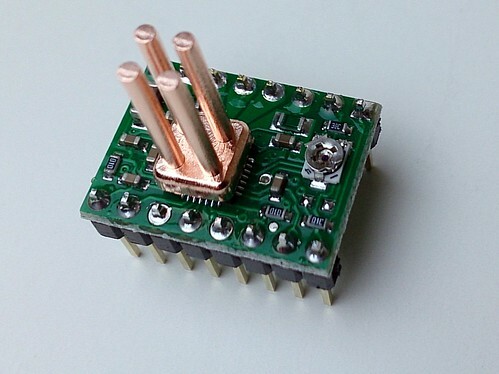 A generic ATX power supply is used to power the stepper drivers. 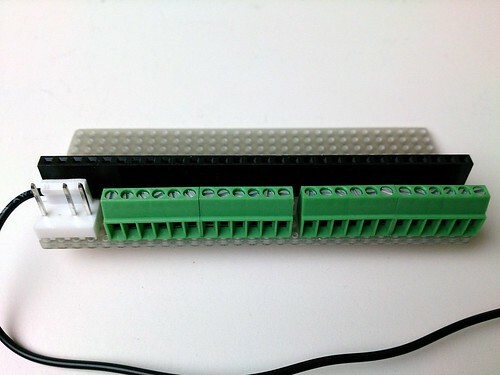 Arduino is typically powered by USB bus, but if it’s not connected to USB, it can be powered by the 5V line (red) from the ATX PSU. 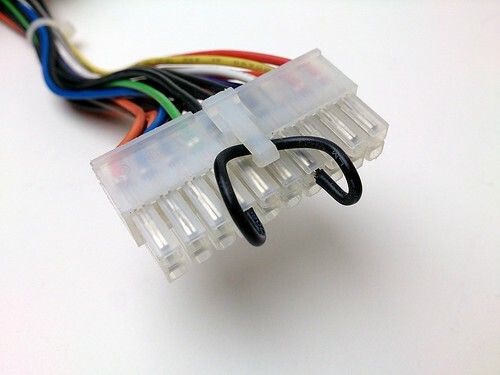 To use the power supply switch to turn it on or off, connect the green wire on the ATX PSU motherboard connector to any black wire (pic 2). If you choose to mount electronics to the frame of your robot, be sure to use rubber/neoprene washers between the frame and the mounting plate. This reduces vibration and lowers the chances of an occasional loss of electrical contact (pic 3).